The Middle East produces more than 30% of the crude oil produced globally, and had 385 drilling rigs in October 2017. After the crude oil price started increasing in the second half of 2016, the oil & gas activity in the region started stabilizing slowly. In November 2017, crude oil price crossed USD 60 barrel mark. The region is expected to witness an increase in oil & gas activity in 2018, with Saudi Arabia being the leader, and Iran and Iraq to register a high growth rate. 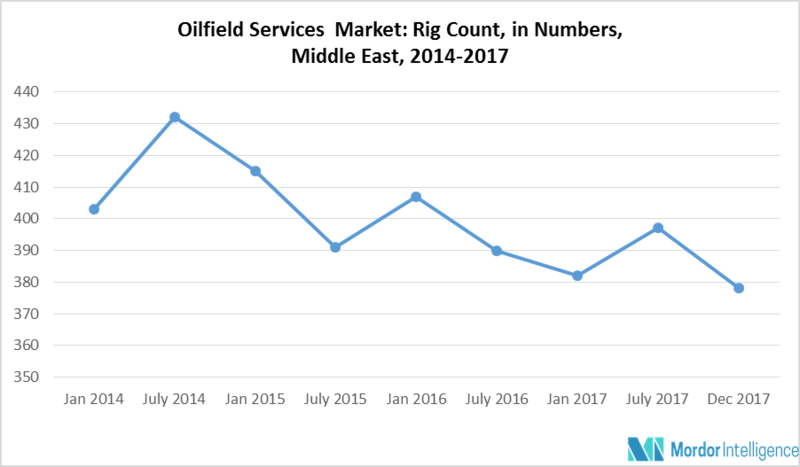 As a result, the demand for oilfield services is expected to increase in the region during the forecast period. Oilfield services are required at every stage from exploration to production. The Middle East is expected to witness huge investment in exploration and production activity in the coming years. In 2016, Saudi Aramco planned to invest more than USD 330 billion by 2025, of which 70% is expected to be local content. The investment aims to reinforce its pre-eminent position in the oil & gas industry, maintain its spare oil production capacity, and pursue a large exploration and production programs centering on conventional and unconventional gas resources. The company has also highlighted their plan to double their natural gas production to 23 bcfd over the coming decade. As a result, the investment plan of the biggest oil & gas company in the region is expected to drive the demand for oilfield services. Between 2000 and 2016, out of total crude oil discovered, 45% was from Iran. In the last four to five years, the trend changed, and large volumes were discovered in Iran led by projects, like Mirawa, Faihaa, and Amara South. Iraq’s Oil Ministry is expected to invite international companies to compete for nine blocks on the country’s border with Kuwait and Iran in 2018. Lukoil, the Russian oil giant, has targeted expansion of its operations in the Middle East. The company has targeted new projects in Kuwait, Iraq, Oman, and the UAE. In November 2017, Rosneft and National Iranian Oil Company signed a roadmap for strategic cooperation for exploration and production in Iran. The cooperation is expected to involve USD 30 billion. Exploration and production from discovered oilfield and investment by Russian companies in the region are expected to drive the demand for oilfield services. Carbonate formations are estimated to hold 60% and 40% of the global oil and gas reserves, respectively. In the Middle East, roughly 70% of oil and 90% of gas reserves are trapped in carbonate. The oil & gas industry in the Middle East is undergoing a sea change, with many regions’ conventional oil & gas reserves facing depletion. Many countries are targeting gas reserves in carbonate formations and have been investing quite heavily over the last few years in R&D in different kinds of fracturing technologies. But the region lacks the amount of fresh water needed in fracking technology. With waterless fracking technologies at their nascent stage and desalination proving to be a very costly process, getting the unconventional gas out of the ground is challenging. This offers great opportunity for local as well as foreign drilling service companies to cater these new unconventional gas field discoveries, with their latest fracking technologies, which utilize less water. December 2017: Schlumberger has received two contracts from Saudi Aramco for drilling rigs and services for oil and gas wells. Under the contract, Schlumberger Integrated Drilling Services will provide drilling rigs and services for up to 146 gas wells and up to 128 oil wells for three years. May 2017: Schlumberger launched the new SpectraSphere fluid mapping-while-drilling service. The service provides downhole fluid composition during drilling with real-time pressure measurement while drilling. May 2017: NOV announced a joint venture with Saudi Aramco to manufacture high specification drilling rigs and advanced drilling equipment. The proposed joint venture will establish a training center to develop Saudi technicians to maintain and operate the sophisticated drilling technology produced by the venture. MAJOR PLAYERS: Schlumberger Limited, Baker Hughes (a GE Company), Weatherford International PLC, Halliburton, National-Oilwell Varco Inc., TechnipFMC PLC, China Oilfield Services Ltd, Saipem SpA, Ensco PLC, Nabors Industries Ltd.
Effect of oil prices, development in oilfield services, evolving technology and government regulations in the oil and gas industry. 9.1 Anton Oilfield Services (Group) Ltd.
9.9 Swire Oilfield Services Ltd.